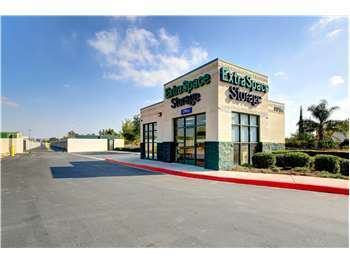 Located near the intersection of S Riverside Ave and E Rialto Blvd, Extra Space Storage serves Rialto residents near Downtown Rialto, Rancho West, Rana, and Bloomington. Locals will recognize our facility near Pizza Hut and Dairy Queen a few minutes north of Walgreens and Boyd Elementary School. With a variety of storage unit sizes, vehicle storage, and exceptional security, Extra Space Storage on S Riverside Ave can handle your residential or commercial storage needs in Rialto! We can accommodate items of all sizes at our Rialto storage facility! We offer units ranging from 5x5 to 25x30 with convenient features like indoor access, first-floor access, drive-up access, and more. At Extra Space Storage, we're committed to providing the best security for our customers. That's why our S Riverside Ave storage facility has 24-hour video surveillance and electronic gate access. Extra Space Storage offers secure vehicle storage in Rialto. With 10x20 to 9x50 outdoor parking spaces and 10x10 to 25x30 enclosed drive-up units, you can store cars, motorcycles, boats, and RVs at our facility. Extra Space Storage is dedicated to providing you with the best self storage experience possible. Our facility is always secure, well-maintained, and clean, and our friendly staff is here to ensure that your experience is nothing but excellent. Contact us today to reserve a storage unit in Rialto! Friendly, fast and great prices including the first month is free! Can't beat Extra Space Storage Rialto! My wife and I were looking for a storage facility close to our residence. I called extra storage on a Sunday and the operator was able to find us a location near our residence. The only set back was that the office was closed on Sunday but we knew that this location would be a perfect fit for us. We received a call from Mike and was invited to come down to the facility. We came down and was welcomed by name from Bill and Mike. That’s a great first impression. Mike went over 2 different units with us. We picked our unit and moved in. ExtraSpace Storage is great place to hold all your valuables. The service we received is awesome. We defiantly will use ExtraSpace Storage again if need too. Very professional team. Willing to help you with your situations. Good location, good lighting, helpful and courteous employees. Bill helped me out very much. He was helpful, informative, polite and answered all my questions. The best customer service I've ever had! I'm impressed! I would recommend this extra space storage. Just look at their ratings! Extra Space Storage provided me with excellent customer service, exceptional quality units, an organized and speedy process, reasonable rates, and a very convenient location. I would recommend no other than this business when fulfilling your storage needs. Great customer service, they did everything they could to get me the best deal possible. Thank you guys. Jessica at customer service can help you get exactly what you need a very comfortable experience and I highly recommend to rent here. Extra Space Storage is a very good facility it's clean the representatives are very very polite the answer all your questions and make sure that you are completely informed before leaving the premises. And they also follow up with you through email and phone calls and the security system is outstanding from what I could see the time I was there and their prices are also very affordable. Carlos and Luis are awesome. Other staff not so knowledgeable. Front office needs some staffing organization. Clean and secure location. Easy drive up access. I have been there before long time ago. and I have to get that storage again cause I feel trust myself that place is good area. The service is good and the gate is closed from 10 pm to 6 am. I can go there to open the gate with code from 6 am to 10 pm is sound good and perfect for me. if you think u need that storage and try with it. Great location... Clean facility.... Great customer service..great price for the size. I have had an excellent experience w/ Extra Storage. I can compare it to another storage facility where I stored for 9 yrs. They were good but ruthless when it came to monthly payments. My contract allowed for a 10-day grace, but they would not honor that grace period & would call hassling me and my family members (that were listed as emergency contacts). My poor sister thought my storage burned down. Then learned they just wanted my monthly payment (which was only 3 days past the due date) Hence, I love extra storage & the people. My only issue was I got to the office one Saturday morning at 9:10am (10 min after scheduled opening time) and nobody was there. And there is a single gate to walk through that can be left open very easily. Other than those two things (which really aren't a huge deal anyway) - it's perfect! I think that there are many people living in this facilty which makes me wonder how safe is my belongings. I really think the manger here is great but, I tried to contact them one night because someone had left there storage open and no one answered or called me back. I really hope that the alarms are checked regularly and that they are working. Im happy i changed my storage to this place they were very helpfull in every way!!!! Just signed up on Saturday and Alexis was really helpful in explaining the entire process and also to help me determine the exact size of the unit that was going to be better for my storage needs. I like my unit and haven't had any problems with this place or the workers. When I pulled up to the property everything looked very clean, office smelled really good and the girls were nice. I like the gate hours and the place is nice. Staff is chill. I have another unit at the facility and have enjoyed the easy access. The office employees are very helpful. The apparence of the facility is very clean and safe. I like the new manager. The place needed a change and it already looks better. Ive had a storage here for awhile and its nice to see people excited about what theyre doing. I just moved out today because I did not need the unit anymore, but If I ever need one again I will definitely be back. I was shocked that this place got taken over by a new company. But the people in the office were very sweet and accomodating. I like the new gate hours and this seems like a good company. The property also looks a lot cleaner. Coming from the CA 210, head south on Riverside Ave for 5 miles. You will pass the chamber of commerce, Site will be on the left-hand side, just below the Metro station. We are across the street from Tacos Mexico and near the Green Tree Senior apartments. Coming from the 60 freeway, get off on Main st. and head North, Main will turn into Riverside Ave. Stay on Riverside Ave for 5.4 miles. Site will be on the right hand side. We are across the street from Tacos Mexico and near the Green Tree Senior apartments. Coming From the EAST 10 West exit Riverside Ave, Right on Riverside Ave 2 miles north. Site will be on your right hand side passing Merrill Ave Coming From the EAST 210 West exit Riverside Ave, Left on Riverside Ave 5 miles South. Site will be on your Left hand side passing the Rail Road tracks We are across the street from Tacos Mexico and near the Green Tree Senior apartments. Coming from LA 10 East exit Riverside Ave , Left on Riverside Ave 2 miles north. Site will be on your right hand side passing Merrill Ave. Coming from LA 210 East exit Riverside Ave ,Right on Riverside Ave 5 miles South. Site will be on your Left hand side passing the Rail Road tracks We are across the street from Tacos Mexico and near the Green Tree Senior apartments.